CTAAB's foundation is a commitment to a process which ensures impartial and balanced community assessment of all applications. The CTAAB process begins with the submission of a letter of intent to the Staff Director. Pertinent information from the letter of intent is posted on the web in the CTAAB Review Log to allow for competing applications to be submitted. The letter of intent is reviewed against appropriateness criteria from CTAAB's Mission Statement and Screening Criteria. The potential applicant is informed in writing if the project will not be reviewed by CTAAB. If the project meets CTAAB's criteria for review, Staff Director sends an application to the proponent, who submits it for review. The issue is further researched utilizing peer-reviewed journals, information from experts and documentation from the Finger Lakes Health Systems Agency, where applicable. 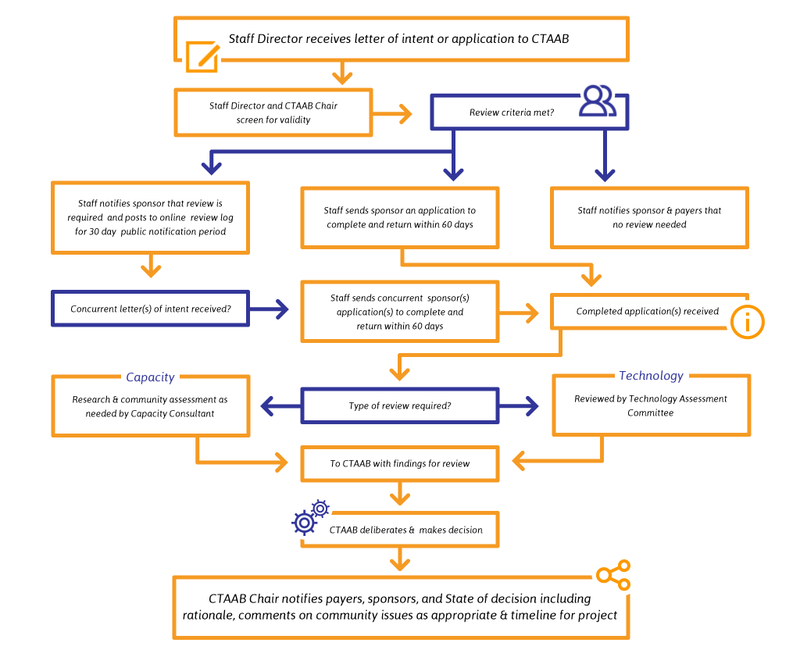 The Technology Assessment Committee or Capacity Consultant reviews the complete application, performs a detailed analysis of the issues and forwards its findings to CTAAB. CTAAB investigates and makes a judgement on the issue, carefully considering the impact on all members of the community. CTAAB's non-binding judgement is conveyed to the local payers for consideration in the formulation of their reimbursement policies. Additional health service capacity is warranted, taking into account geographic location, access, cost-effectiveness, quality, and other community issues. A service is defined as a program offered by a health care provider for which public or third party reimbursement is sought. Examples: ambulatory surgical centers, sleep centers, women’s health centers, infusion therapy programs, transplant programs. A technology is defined as a drug, device, procedure, test, or treatment rendered in the course of providing health care. Examples: linear accelerator machines. A major capital expenditure is defined as an expenditure within the health care system that meets or exceeds the parameters stated in the Screening Criteria. Examples: renovation of a hospital unit, addition of surgical suites. Other significant community issues as identified by the payers. In addition to the above-listed criteria, the following issues are of importance to the community and will always be reviewed regardless of financial impact: cardiac catheterization labs, operating rooms, diagnostic and treatment centers, transplant services, hospital beds, magnetic resonance imaging (MRI) units, positron emission tomography (PET) scanners, sleep beds, computed tomography (CT) scanners, lithotripters, and hyperbaric oxygen therapy (HBOT). Note: As a part of the analysis of a proposal for an incremental CT scanner, review of ICD-9 or other diagnostic codes will be undertaken to determine if the current and/or projected volume of scans is justified only on the basis of cardiac-related procedures. Exceptions will be considered by CTAAB on a case-by-case basis. Does the technology meet a patient care need? Does the technology have final approval from the appropriate government regulatory bodies? Does the scientific evidence permit conclusions concerning the effect of the technology on improvement in health outcomes? Is improvement attainable outside the investigational setting? How does the technology compare to existing alternatives? Will the technology result in substitution? Does the technology warrant further study? Are there alternative means to achieve the intended outcomes? What is the cost of the technology compared to the benefits attained from using it? Does community need justify this expenditure? Under what circumstances should the technology be used? What is the projected community need as compared to the projected capacity, both with and without the addition of the proposed capacity? Does existing and/or estimated future utilization of the proposed service or technology exceed the currently available capacity? Does the currently available capacity meet standards of care? Are there alternative means to achieve the intended outcomes of the proposed addition to capacity? How does existing or estimated future utilization compare to established benchmarking studies? What is the expected financial impact of the proposed service or technology on the community health care system? What is the cost of the proposed capacity compared to the benefits attained from using it? Is there adequate access to existing proposed service or technology to all community members, including traditionally under-served populations? CTAAB may also comment on other issues of community need on an as-needed basis during a review.